Enhance your child's comfort with stylish, breathable biking shorts perfect for school, play and daily athletics. Looking for the softest, more flexible undershorts to pair with your daughter's dresses, skirts, school outfits or outerwear? Then these Caomp girl's biking shorts are the best choice for giving your child a fashionable, yet comfortable start to every adventure. Crafted with GOTS-certified organic cotton that's completely free of dyes, our natural fabric is softer, more durable and gives your children the freedom they need to run, jump, play, cycle and live life to its fullest. Gentle on skin, our breathable bike shorts won't chafe or irritate the skin, and they're flexible and rip resistant, making them ideal for spring and summer weather, running on the playground, or just looking trendy and stylish. Get these cute, comfortable undershorts for your little girl today and let her run and play with breathable, relaxing support. Click 'Add to Cart' above to get yours now. Trendy Girl's Under Shorts - Designed for daily wear as under wear for dresses, these flexible, form-fitting bike shorts offer discrete coverage and comfort. 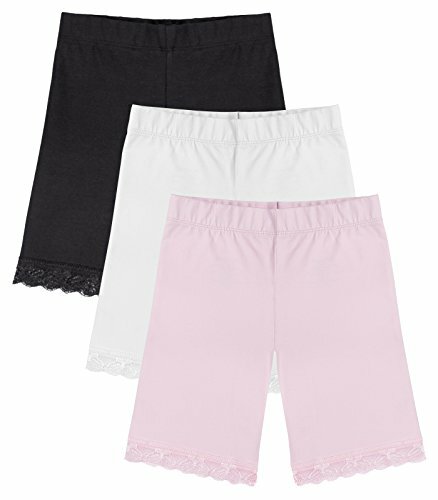 Assorted 3 Packs - Every order comes with three packs of exercise bike shorts, including colors like black, white, pink, and navy; perfect for every style. Come in sizes 3 to 14. Intricate Lace Trim - Each pair of cute kid's bike shorts features beautiful lace trim and ideal inseam length to give them an adorable, beautiful touch right at the hem line of most dresses. All-Purpose Comfort - These tag-less undershorts are flexible and breathable for layering under skirts, dresses, long shirts, school uniforms, or spring and summer wear. Certified Organic Cotton - A blend of 95% GOTS-certified organic cotton and 5% super stretchy spandex, these shorts are extra soft, gentle on soft skin and free of low-impact, azo dyes.